A research article in the January 2015 issue of the JCI demonstrates a follicular helper T cell signature in the setting of autoimmune diabetes. The authors used a transgenic mouse model of diabetes to probe the gene expression of islet-specific T cells by microarray and showed that T cells with a follicular helper T cell phenotype efficiently transferred diabetes to recipient animals. Further, their work demonstrates a relationship between IL-2 sensitivity and the propensity to acquire a follicular helper T cell phenotype in type 1 diabetes patients. Their research provides a novel framework for therapeutic intervention and biomarker identification in the setting of type 1 diabetes. We asked the lead author, Rupert Kenefeck, about his work. How did you become interested in microbiology/immunology from such an early age? When I was young, I knew I was keen on biology and science in general. As I progressed through university, my keenness not only for immunology in particular, but the associated control of disease, really started to become engaged. At the University of Newcastle, Professor Colin Brooks, who did some fantastic lectures, sparked my interest initially. He took us through the history of immunology and the early experiments, which helped me understand T cell development and how those earlier experiments were conducted. That really caught my attention. It also was a bit of a challenge, I suppose, because in the early days it seemed really quite complex, and picking that apart really appealed to me. From that point on, I was hooked. How did you transition from the undergraduate work to your Ph.D. work and current postdoctoral work? I had a conversation with my project supervisor, Professor Brooks, and I remember him sitting me down and telling me that a Ph.D. was the hardest thing he’d ever done in his life and that I should only really do it if I was very serious about it. I thought, “Well, I think I am. I think I’d quite like to pursue this line of work.” I knew I was really interested in immunology, particularly regulatory immunology, and how that influences disease processes and immunity. But because I did not want to drop the microbiology side, I hunted around for people who were researching the impact of the immune system on infectious processes. It happened that Dr. Karen Robinson at the University of Nottingham was doing research on H. pylori, which is responsible for a great deal of gastric cancers. It fascinated me how the bacterium was able to maintain that niche so successfully. As it turned out, one of its strategies was to provide an environment that generated regulatory T cells, likely responsible for quashing the immune response, which might otherwise have cleared the bacteria. During my Ph.D. work, I started to really get into regulatory T cells and immune regulation and then started to think that immunity was the way to go, as there are so many autoimmune diseases and responses whose mechanism we do not yet know. With the research you presented in this paper, what were your initial expectations? Figure 1: Uncovering a follicular helper T cell signature in type 1 diabetes. Initially, we didn't exactly know. We knew that T cells were important in the onset of diabetes, and Professor Walker knew already that without T cells in her mouse model, the mice did not get type 1 diabetes. The initial aim was to characterize the T cell response in an unbiased way (Figure 1). The mouse model was key to this in that one can analyze tissues from mice that aren’t readily accessible from humans. We did not know what the outcome would be, and that was what was exciting about it in a way. That kind of analysis had not ever been done outside of this paper — the microarray analysis to characterize the cells responding to a host antigen. At that point, we were lucky enough to identify a strong T follicular helper cell signature in the mouse microarray data, and this gave us a strong lead to follow up in patient samples. How do you see this translating into future studies involving humans and translating what you’ve learned in the transgenic mouse models into human therapies? To treat a complex disease like type 1 diabetes, we need to understand all the underlying mechanisms. There are a host of associated genetic risk factors, and we also know that environmental factors play an enormous role, because diabetes is increasing at a rate that cannot be attributed solely to genetic drift. It’s really important for us, as diabetes researchers, to understand how those changes affect the immune system and the underlying mechanisms. An understanding of these altered mechanisms will help us to develop drugs and treatments to regulate this immunologic system. For example, there’s a trial at the moment in which escalating doses of IL-2 are given to patients. We know that IL-2 is important for the support of regulatory T cells, but also that IL-2 inhibits T follicular helper cell differentiation. T follicular helper cells produce IL-21, which is able to modulate the function of regulatory T cells. By reducing production of IL-2 from conventional cells, IL-21 is essentially starving those regulatory cells of IL-2. IL-21 can support conventional T cell activation in the absence of IL-2 as well. With this framework, we might be able to come up with interventions to modulate the immune response, whether it be by IL-2, IL-21, or other small molecules. All of these systems tie into each other, and we need to understand the broad network of systems in order to know how interventions are going to change them. Many systems have their own built-in homeostatic feedback. What do you think contributed the most to your success in research so far? The biggest aspect was having access to and expertise in the mouse work and the human work, and having basic research bolted right onto the side of a working clinic. We had clinical input from the clinicians and basic science input from people like myself, Professor Walker, and others in the lab. We all have our own expertise, and being able to go next door and ask someone what he or she thinks of a particular idea that we’ve had is really fundamentally important. The new institute that we're in now is really focused on that kind of translational research, taking basic science and having the clinic influence the basic science and the basic science influence the clinical decisions that are made. Professor Hans Stauss, who’s really spearheaded this institute, has recruited people in with all sorts of expertise, from T cell regulation to transplantation to graft versus host disease — all of these things feed into each other. You do not have to go far to get someone who’s the world’s leading expert in something that you want to know about. It is only going to get better, because we are in phase one of development of the Institute of Immunity and Transplantation, and the money secured for phase two will fund another research building and attract more researchers. How did having clinical exposure to diabetic patients in the clinic affect you and your research? That’s something that I really enjoy doing. I’ve been in the clinic speaking to patients about the research and explaining what we’re doing. We had a really good response. Almost everybody that we speak to is really interested in the research and thinks it’s important and is really eager to help, which is great. It’s nice to have that feedback sometimes, and you feel like you’re doing something worthwhile when you speak to the patients. I’ve also done talks for parents of children with type 1 diabetes through Diabetes UK and the Juvenile Diabetes Research Foundation. The level of understanding and knowledge that those parents have is sometimes startling. You get some fantastic questions, and it’s a pleasure to go and speak to these invested and inquisitive people. Their children are in the time of their life where this research, moving at such a rapid pace, may benefit them in their lifetime. It gives them a lot of hope, and it’s quite inspiring. We often get questions from patients about whether these studies are relevant to people currently with type 1 diabetes, or whether the research is aimed at preventing the future development of diabetes. I always say to them that it’s all of these things and that this research could potentially benefit patients at all stages of the disease. If we can halt the immune response earlier, these studies will help us prevent them from fully developing type 1 diabetes. For people who already have type 1 diabetes, there are therapies, including islet transplants and stem cell treatments being developed, intended to enable us to control the immune system. What advice do you have for trainees who are pursuing research and considering careers in the biomedical sciences? Communication of science is really important. More and more funding bodies are pushing this point, and they are right to do so. People are interested in science research, and people want to know where their money is going. You have to remember that all of the money that we’re using is the public’s money and has been provided by individuals who worked very hard for it. They have a right to know what we’re doing with the funds, and they have a right to expect us to be able to explain that properly to them. It’s really important to find a lab that fits and offers the type of research that you’re interested in. Often, you won’t know that until you’ve spoken to people who are there. It’s really important just to talk to people. Researchers love talking about their research. You’re never troubling somebody by asking them about it. You only learn, and at worst you learn something and nothing comes of it, or at best you find a future career. So many breakthroughs come from talking to people from your own field, but also from other fields. We work with collaborators to get the most out of our data, because otherwise we end up looking at the same things we know to look for all of the time. With their insights, you can take a step back and look at the data with someone in an unbiased way with their expertise — that’s really important. Talking to people and communicating your research is never a bad thing; it benefits you, and hopefully people find it interesting. What drives your passion for research? It’s nice to think that your research might one day help somebody. It’s also exciting from the point of view that you’re at the cutting edge of something. The result that you’re going to get next week, no one’s ever had before. That’s exciting, and quite motivating. Initially you go into research because you’re curious and interested in learning how things work. It’s sometimes frustrating when you don’t know how things work, but it makes you want to push those boundaries forward. But the more you get into it and the more you come into contact with patients, the more you start to realize that your curiosity and drive to push forward our understanding of these diseases might actually make a difference in someone’s life one day. That’s quite inspiring. You’re constantly reminded of that fact when you’re working so closely with the clinic, like we are here. I would like to give a special thanks to Professor Lucy Walker, who, despite being the busiest person I know, always has time to talk through data and ideas and to the rest of our lab for their help in making this project a success. 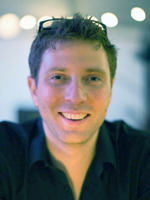 Rupert Kenefeck, Ph.D., is currently a postdoctoral scientist in Lucy Walker’s laboratory at University College London. He received his Ph.D. in immunology from the University of Nottingham. Dr. Kenefeck’s research expertise is in patient-based autoimmune research, specifically autoimmune diabetes. Freddy T. Nguyen is an M.D./Ph.D. candidate at the University of Illinois at Urbana-Champaign. He is the Founder of the American Physician Scientists Association and served on the Associate Member Council of the American Association for Cancer Research, His research interests currently lie at the intersection of biomedical optics and cancer research. He received his B.S. in Chemistry and B.A. in Mathematics from Rice University. Chirag Patel earned his M.D. and Ph.D. from the University of Texas Medical School at Houston. He completed a preliminary year of residency training in internal medicine at East Tennessee State University and is currently a resident physician in neurology at the University of California at Los Angeles David Geffen School of Medicine. Dr. Patel received his B.S. and M.S.E. in biomedical engineering from Johns Hopkins University. Citation Information: J Clin Invest. 2015;125(1):292-303. https://doi.org/10.1172/JCI76238. The strong genetic association between particular HLA alleles and type 1 diabetes (T1D) indicates a key role for CD4+ T cells in disease; however, the differentiation state of the responsible T cells is unclear. T cell differentiation originally was considered a dichotomy between Th1 and Th2 cells, with Th1 cells deemed culpable for autoimmune islet destruction. Now, multiple additional T cell differentiation fates are recognized with distinct roles. Here, we used a transgenic mouse model of diabetes to probe the gene expression profile of islet-specific T cells by microarray and identified a clear follicular helper T (Tfh) cell differentiation signature. Introduction of T cells with a Tfh cell phenotype from diabetic animals efficiently transferred diabetes to recipient animals. Furthermore, memory T cells from patients with T1D expressed elevated levels of Tfh cell markers, including CXCR5, ICOS, PDCD1, BCL6, and IL21. Defects in the IL-2 pathway are associated with T1D, and IL-2 inhibits Tfh cell differentiation in mice. Consistent with these previous observations, we found that IL-2 inhibited human Tfh cell differentiation and identified a relationship between IL-2 sensitivity in T cells from patients with T1D and acquisition of a Tfh cell phenotype. 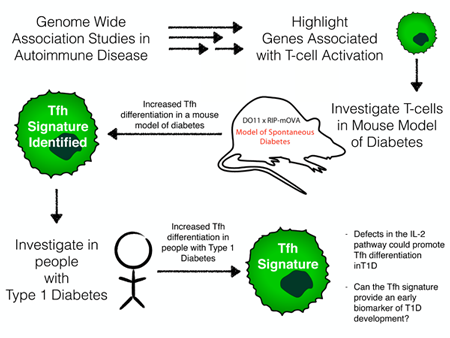 Together, these findings identify a Tfh cell signature in autoimmune diabetes and suggest that this population could be used as a biomarker and potentially targeted for T1D interventions.